Soybean is presently grown almost exclusively as a protein and oil-seed crop in the USA, but it was previously a popular summer annual forage legume. Soybean may still be considered a viable alternative forage when alfalfa or clover are in short supply due to winter-killing or drought conditions. Recent research at Arlington, WI has demonstrated that it is possible to produce greater than 4 ton/acre of soybean forage containing 20% CP, 30% ADF, and 40% NDF. This makes soybean a very attractive alternative when high quality forage is in short supply. What type of soybean and maturity level should be planted? Recent research has been conducted to determine if there are varietal differences in yield and quality of soybean grown for forage (Hintz et al., 1994, Hintz et al., 1992). There have also been releases of new soybean varieties developed specifically for forage production, and these were tested in Minnesota (Sheaffer, et al., 2001). The results of this research show that in order to optimize forage yield and quality, standard grain varieties rather than the new forage soybean varieties would be the best choice. The reason is that, like with corn for silage, grain makes an important contribution to whole-plant feeding value. The forage types had comparable or slightly greater yields but low forage quality compared to standard varieties since the harvested portion of the plant contained a low percentage of pods and grain. Using a variety that matures 5 to 15 days later than would normally be planted for grain production can provide up to 0.6 ton/acre extra yield. Therefore, for high quality and good yield, a maturity of soybean that you would plant for grain, or if you are certain that the crop will be harvested for forage, a slightly later maturing variety, is recommended. What plant population or row spacing should be used? Best forage performance was obtained when soybean was planted at population levels comparable to those recommended for grain production (100,000 plants/acre). Narrow row spacing (7.5 in.) produced 0.5 ton/acre or 17% more forage than when planted in wide rows (30 in.). Feeding value was not affected by either population density or row spacing. What about weed management and feeding restrictions? Weed management is an issue in all annual crops whether they are grown for grain or forage. Glyphosate resistant soybean varieties can be used for forage. There is no feeding restriction of GMO crops. The economics of GMO seed cost versus conventional seed cost and resulting herbicide programs should be compared when deciding on a weed management program. If you plant conventional varieties and plan on drilling the soybeans in narrow rows, a single application of a pre-emergence herbicide should give adequate control. If you plant in wide rows, a post-emergence herbicide application may be more effective. The concern you have to be aware of is feeding/grazing restrictions noted on the labels of the products you choose to use. Be aware of any feeding/grazing restrictions noted on the pesticide labels and plan ahead if there is a chance that the crop will be used as forage. When should soybeans be harvested as a forage? 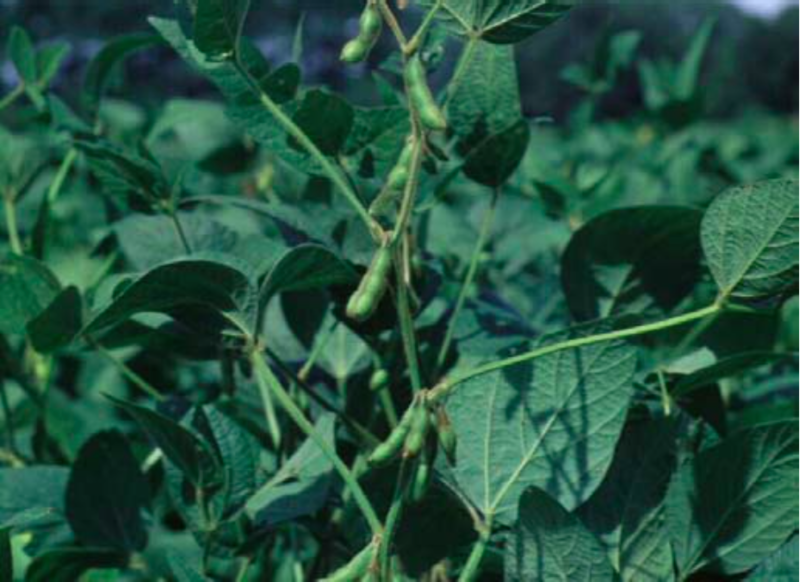 As previously mentioned, the best combination of quality and yield is realized when soybean is harvested for forage near grain maturity at the R7 stage, when one pod on the main stem has reached its mature color. This is the stage when lower leaves of the plants are beginning to yellow but remain attached to the plant, and seeds completely fill the pods. It is important to remember that soybean should reach this stage before frost which, based on your planting date, should help you decide what maturity level to plant. How should soybean forage be fed to dairy cows? This research showed that soybean forage quality is similar to that of alfalfa forage with 150 RFV. The major difference is that whole plant soybean forage contains a substantial amount of oil because of the contribution of seed. While this oil can serve as a source of energy for milk production, too much oil plus fat in the ration can reduce intake and fiber digestion. To avoid negative impacts of too much vegetable oil in the ration, soybean forage should make up no more than 50% of the total ration dry matter. Hintz, R.W. and K.A. Albrecht 1994. Dry Matter Partitioning and Forage Nutritive Value of Soybean Plant Components. Agron. J. 86:59-62. Hintz, R.W., K.A. Albrecht, and E.S. Oplinger. 1992. Yield and Quality of Soybean Forage as Affected by Cultivar and Management Practices. Agron. J. 84:795-798. Sheaffer, C.C., J.H Orf,., T.E. Devine, and J.G. Jewett. 2001. Yield and Quality of Forage Soybean. Agron. J. 93:99-106.